The Alberta Wild Rose. The official provincial floral emblem. The Wild Rose blooms from late May, lasting until early August. ​called a "rose hip", edible and known for its high vitamin C content. Have been enjoying these on the trail since childhood. A walk in Shouldice Park. ​The City on the condition of it becoming a park. ​I love geese. Even though one pecked my daughter's ear when she was two. These are only half the height they'll be by the end of the summer. ​We still have all of August left!!!!!!! It took 8 years before benches were graciously added to complete this setting. And I still have yet to have a seat. Anyone know what it says or means? ​Sunshine, don't go away any time soon, ok? Lights Going Up or Graffiti? These marks appear city-made, but then again, they look a little odd. Is there a way to find out for sure? 311? Must check. UPDATE: 311 didn't know and neither did the "call before you dig" place they told me to call! An attempt at one of Vincent van Gogh’s finest works, The Starry Night. to express the need for world peace. A lady texted me back thanking me for my message. the words that mean so much in our broken world. statement in the name of peace… Thank you. We have the best community! ​And it's always beautifully and seasonally landscaped -- thanks Pixie Gardens! Cozy [koh-zee]: Snugly warm and comfortable. ​Chuck Wagon: a type of "field kitchen” covered wagon historically used for the storage and transportation of perishable food and cooking equipment. Forming part of a wagon train of settlers, chuck wagons were the very first "mobile kitchens", feeding traveling workers such as cowboys or loggers. If this were my yard, I'd feel like the work to maintain it might take away any remaining ability to enjoy it! To whoever it is that has beautified this corner lot, you've made gardening to this calibre look effortless. All I can say is, "Thank you!" each and every time I walk by. This one would definitely hold up in the rain. A Cougar Ridge Secret Hideout Deluxe! Funny how you can walk the same route time after time and new things, people and places pop out at you. The fiery globes of this purple Allium christophii resemble bursts of fireworks, sparkling, flaring, soaring, illuminating. A true garden celebration! Saw this C in the sky two Junes ago already so it’s great to finally be sharing it on the blog! Then yesterday a huge “L” was right there in front of us sitting at Westside lights (first time I’ve ever seen a cloud make a 90° angle. How is that even possible with big fluffy cotton cumuli?) Anyway, “C” of course stands for “Cougar Ridge Calgary Stampede”! 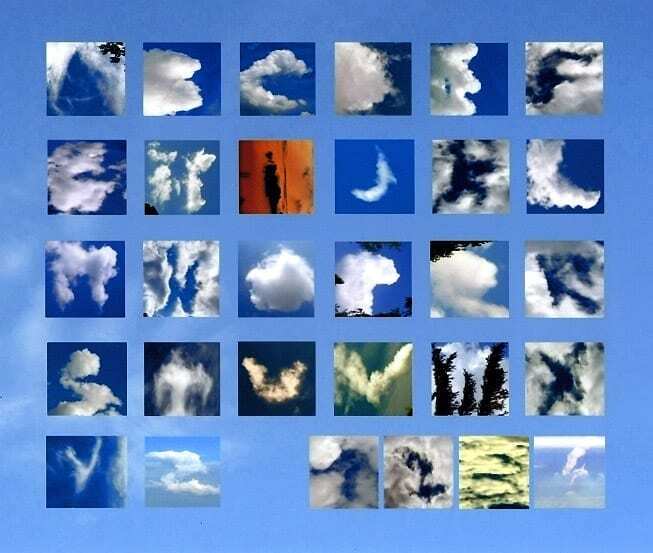 And “L” would just have to be, "Life Up Here" :) Check out this cool cloud alphabet ​from the Cloud Appreciation Society. Who knew?